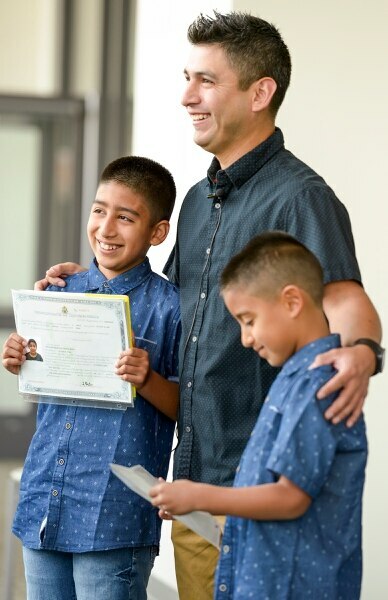 Leah Hogsten | The Salt Lake Tribune Robert Parker celebrates with his sons Sebastian Muro, 10, and Mathis Muro, 8, as American citizens after the boys' naturalization ceremony at the Viridian Event Center in West Jordan, Monday, August 6, 2018. 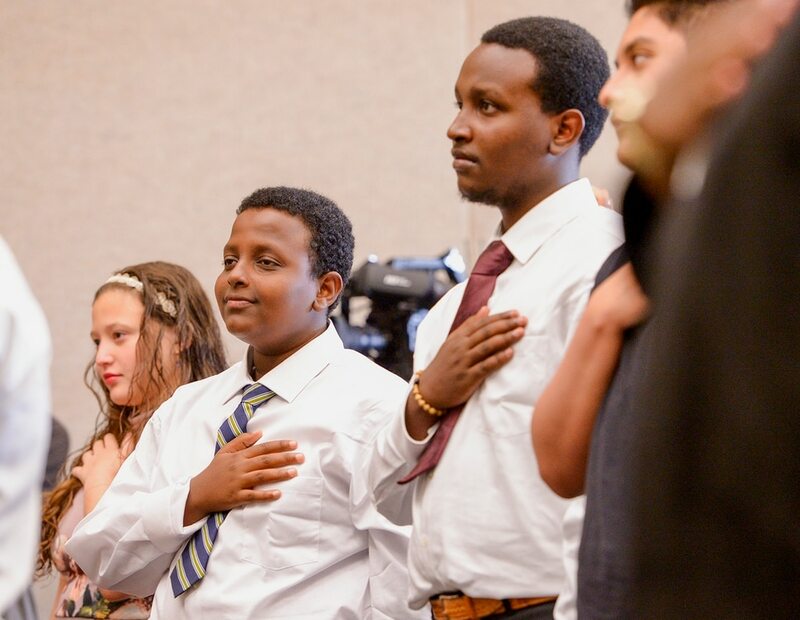 Leah Hogsten | The Salt Lake Tribune l-r With hands on their hearts brothers Michael and Biruk Mekonnen and other youth, ages 5 to 22, representing 8 countries, spoke the oath of citizenship as America's newest citizens during a youth naturalization ceremony at the Viridian Event Center in West Jordan, Monday, August 6, 2018. 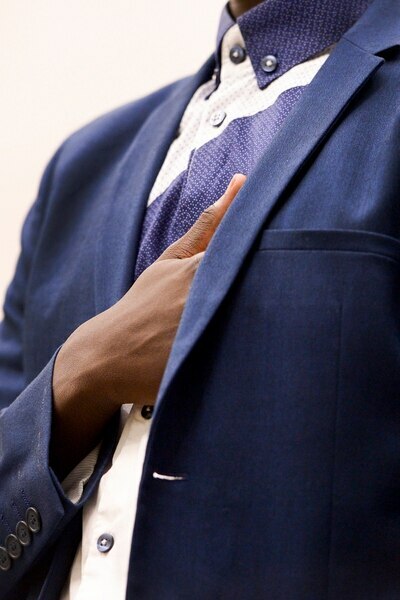 Leah Hogsten | The Salt Lake Tribune Andrew Charles of Uganda slips his hand inside his sport coat during the singing of the National Anthem at his youth naturalization ceremony at the Viridian Event Center in West Jordan, Monday, August 6, 2018. With hands on their heart 21 participants, ages 5 to 22, representing 8 countries, spoke the oath of citizenship as America's newest citizens. Leah Hogsten | The Salt Lake Tribune With a hand on her heart, Julius Charles closes her eyes during the Pledge of Allegiance as her son, Andrew Charles and other youth representing 8 countries, take the oath of citizenship as America's newest citizens during a youth naturalization ceremony at the Viridian Event Center in West Jordan, Monday, August 6, 2018. Leah Hogsten | The Salt Lake Tribune Andrew Charles of Uganda sports a Kenyan bracelet during his youth naturalization ceremony at the Viridian Event Center in West Jordan, Monday, August 6, 2018. With hands on their heart 21 participants, ages 5 to 22, representing 8 countries, spoke the oath of citizenship as America's newest citizens. Leah Hogsten | The Salt Lake Tribune With hands on their heart 21 participants, ages 5 to 22, representing 8 countries, spoke the oath of citizenship as America's newest citizens during a youth naturalization ceremony at the Viridian Event Center in West Jordan, Monday, August 6, 2018. Leah Hogsten | The Salt Lake Tribune Terefe Mekonnen videos his sons Michael and Biruk as they receive their citizenship papers as America's newest citizens during a youth naturalization ceremony at the Viridian Event Center in West Jordan, Monday, August 6, 2018. Leah Hogsten | The Salt Lake Tribune Long Wing Matthew Ko, 7, of Hong Kong grins after he is handed his citizenship papers. Participants, ages 5 to 22, representing 8 countries, spoke the oath of citizenship as America's newest citizens during a youth naturalization ceremony at the Viridian Event Center in West Jordan, Monday, August 6, 2018. Leah Hogsten | The Salt Lake Tribune With hands on their heart 21 participants, ages 5 to 22, representing 8 countries, spoke the oath of citizenship as America's newest citizens during a youth naturalization ceremony at the Viridian Event Center in West Jordan, Monday, August 6, 2018. Leah Hogsten | The Salt Lake Tribune With hands on their heart 21 participants, ages 5 to 22, representing 8 countries, spoke the oath of citizenship as America's newest citizens during a youth naturalization ceremony at the Viridian Event Center in West Jordan, Monday, August 6, 2018. Leah Hogsten | The Salt Lake Tribune Long Ching Tania Ko, 16, of Hong Kong reads her newly acquired American citizenship paperwork during a youth naturalization ceremony at the Viridian Event Center in West Jordan, Monday, August 6, 2018. Leah Hogsten | The Salt Lake Tribune Andrew Charles of Uganda is congratulated by his father Ben Charles at his youth naturalization ceremony at the Viridian Event Center in West Jordan, Monday, August 6, 2018. With hands on their heart 21 participants, ages 5 to 22, representing 8 countries, spoke the oath of citizenship as America's newest citizens. Leah Hogsten | The Salt Lake Tribune Long Ching Tania Ko, 16, squeezes the cheeks of her brother Long Wing Matthew Ko, 7, during their naturalization ceremony at the Viridian Event Center in West Jordan, Monday, August 6, 2018. With hands on their heart 21 participants, ages 5 to 22, representing 8 countries, spoke the oath of citizenship as America's newest citizens. Eliseo Hernandez had just watched two of his daughters raise their right hand, recite an oath and become naturalized U.S. citizens. What did he think? He had a hard time putting it into words. Ximena and Paulina Hernandez, 16 and 13, were among the 21 young people who took the citizenship oath at West Jordan’s Viridian Event Center on Monday. (Connor Richards | The Salt Lake Tribune) Ximena and Paulina Hernandez, 16 and 13, from Mexico, were among 21 immigrant youth who were naturalized as U.S. citizens Monday. 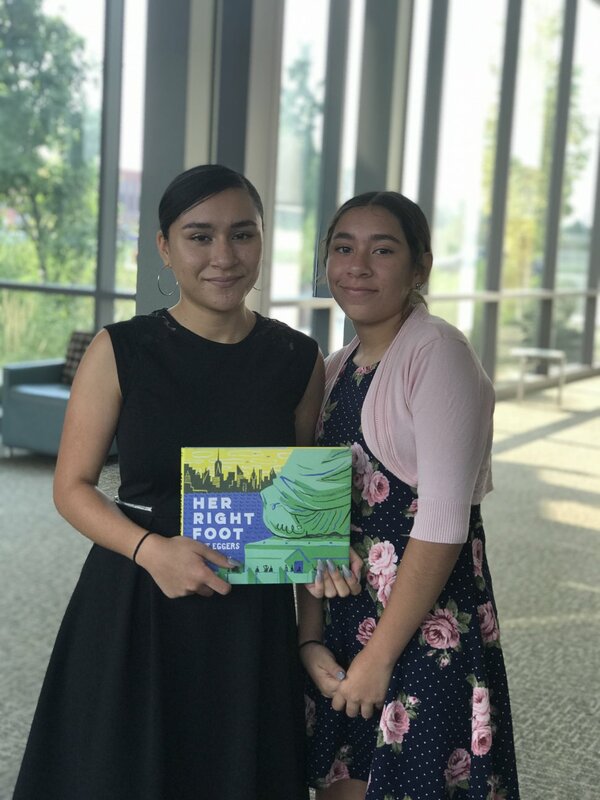 They were each given a copy of "Her Right Foot," a children's book about the Statue of Liberty. Ximena Hernandez, who has lived in the U.S. since she was 7, described “just feeling really happy” that she and her sister are finally able to call themselves American citizens. “I’m grateful for my parents,” she added. 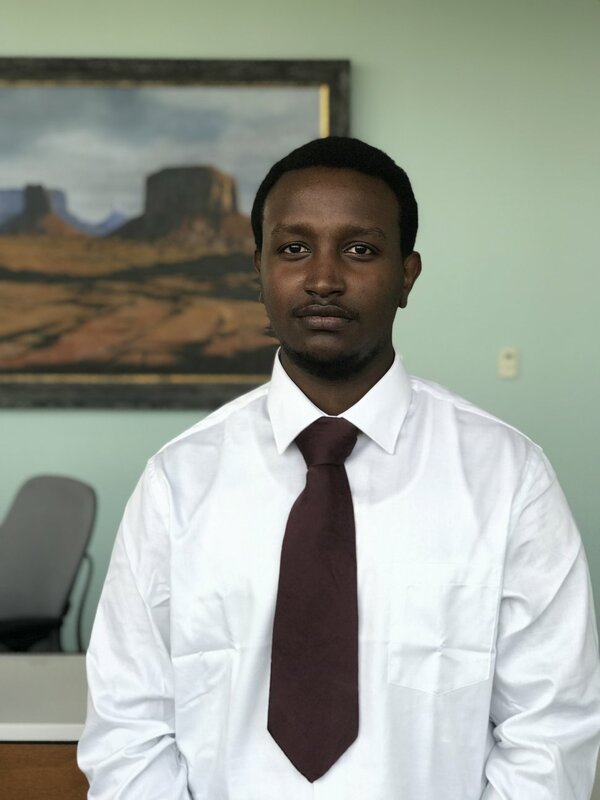 Biruk Mekonnen, 20, said the path to citizenship was a long and difficult one for him. According to U.S. Citizenship and Immigration Services, there were about 5,800 people in Utah who were naturalized as U.S. citizens in 2017 and more than 716,000 people nationally. The Tribune reported last week that Utah has an “alarming backlog” of legal immigrants who are waiting for approval of their citizenship applications. McAdams, along with Salt Lake City Mayor Jackie Biskupski, joined a group of 45 mayors and county executives nationally to ask federal officials to “take aggressive steps to reduce the waiting time,” which can reach up to 20 months. On Friday, 110 adult immigrants from 41 countries were naturalized as citizens and honored at the state Capitol. McAdams’ opponent in the race for Utah’s 4th congressional district seat, incumbent Rep. Mia Love, gave a speech at Friday’s naturalization ceremony.